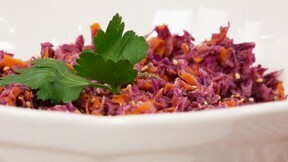 Vegans don't have to miss out on traditional Summer meals with Laura Theodore's all-American Summer recipes for vegans like this purple coleslaw recipe. Put the cabbage, carrots, vegan mayonnaise, mustard, sugar, and salt in a medium bowl and stir to combine. Season with pepper. Cover and chill 2 to 4 hours. Before serving, sprinkle the top of the salad with sesame seeds or gomasio, if using.